진공대사의 사리를 모셔놓은 탑과, 그 옆에 놓여있는 돌로 만든 함이다. 본래는 강원도 원주의 흥법사터에 있었으나 1931년 경복궁으로 옮겨 왔으며 현재는 국립중앙박물관 경내에 있다. 진공대사는 통일신라말 ·고려초에 활약한 승려로, 당나라에 유학하고 돌아와 신라 신덕왕의 스승이 되었으며, 특히 고려 태조의 두터운 존경을 받았다. 탑은 전체가 8각으로 이루어진 기본적인 형태로, 기단(基壇)의 아래와 윗받침돌에는 연꽃을 새겼다. 북모양을 하고 있는 가운데받침돌 표면에는 웅장한 구름과 함께 뒤엉켜 있는 용의 몸체를 생동감있게 조각하였다. 탑신의 몸돌은 8각의 모서리마다 꽃무늬가 장식되어 독특하고, 앞뒤 양면에는 자물쇠가 달린 문짝모양이 각각 새겨져 있다. 그 위로 얹혀 있는 지붕돌은 밑면에 3단의 받침과 2중으로 된 서까래가 표현되어 있다. 경사가 완만한 낙수면은 8각의 모서리선이 굵게 새겨져 그 끝에는 높이 솟아있는 꽃조각이 달려있다. 특히 낙수면에는 기와를 입힌 모양의 기왓골이 사실적으로 표현되어 있고 처마 끝에 이르러서는 암막새, 수막새까지도 자세히 조각됨으로써 밑면의 서까래와 함께 당시 목조건축의 일면을 잘 보여주고 있다. 꼭대기에는 8각의 작은 지붕모양의 머리장식인 보개(寶蓋)가 있다. 한편 탑의 왼쪽에 따로 놓여 있는 돌로 만든 함에는 불교경전과 함께 관련된 유물을 담아두었는데, 뚜껑까지 완전하게 남아있어 그 가치를 지닌다. 지붕의 윗부분을 수평으로 자른 듯한 뚜껑돌과 긴 상자 모양의 몸통으로 이루어진 이 함은 거의 완전하며 온화한 품위를 보여주고 있다. 두 유물의 조성연대에 대하여는 알 수 없으나『고려사』에 남아 있는 기록으로 미루어 고려 태조 23년(940)으로 추측된다. 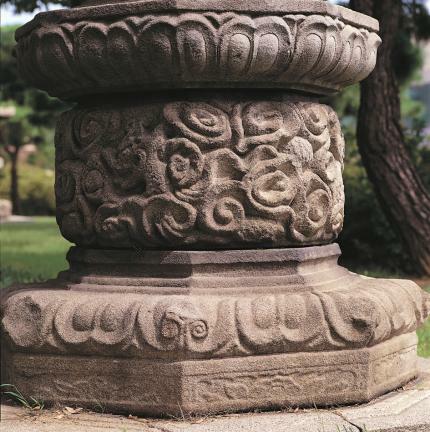 This stupa, made of stone, preserves the sarira of Jingong, a Buddhist monk in the late Unified Silla and early Goryeo periods. It was originally located at the Heungbeopsa Temple site in Wonju, Gangwon-do, but was moved to Gyeongbokgung Palace in 1931. 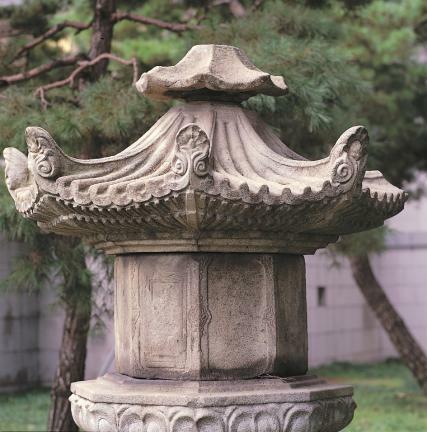 It was removed again and rebuilt in the garden of the National Museum of Korea. 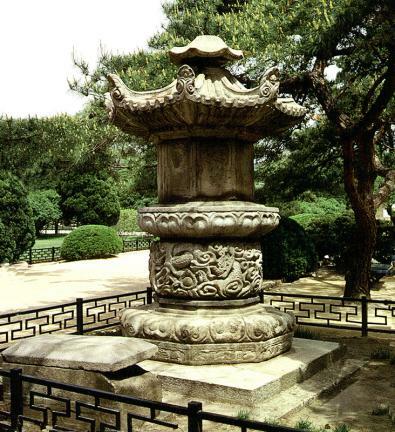 Jingong had studied abroad in Tang Dynasty China and come back to Silla to become a teacher of King Sindeok. He was especially respected by King Taejo of the Goryeo Dynasty. The stupa has a basic octagonal shape. Lotus flowers are engraved on the upper and lower pedestal and the body of a dragon, tangled with magnificent clouds, is vividly engraved in the middle pedestal. 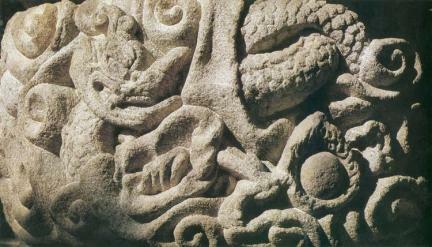 The body of the stupa is unique, since every pillar of the main stone is decorated with a floral design at the edge. The image of a lock in a door is engraved on the both front and rear sides. The roof stone above the body has three-tiered base and double rafters underneath. On the roof edges, the thick octagonal rooflines slop gently and a sculpture of a flower rising high hangs on each tip of the roof edges. The inclined roof looks like the tiled roof in that the furrows are represented realistically and the roof-end tiles are also engraved at the edges of the eaves. This shows a typical feature of a wooden structure of the period, along with the rafter placed under the roof. 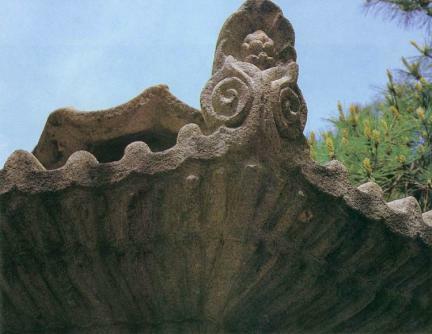 There is a bogae, a finial ornament, in the form of a small octagonal roof at the top of the stupa. At the left side of the stupa, a stone casket is laid in which Buddhist scriptures and the relics related were kept. This is especially valuable since its lid remained perfectly intact. 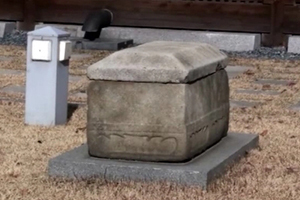 The stone casket is composed of a lid stone, which looks like a hipped roof of which the upper part was horizontally cut, and a chest in shape of a long box. It has remained in perfect condition, and so is extremely valuable. 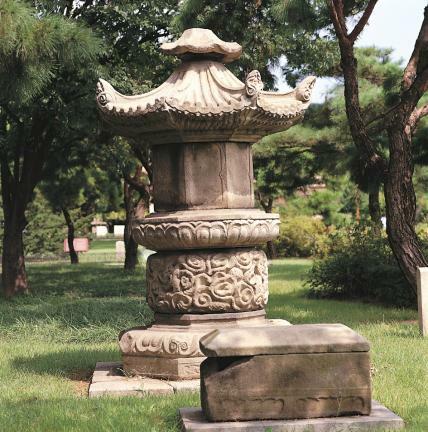 It is not known for certain when the stupa and the stone casket were made but, with reference to the History of Goryeo, they are estimated to have been made in the 23rd year of the reign of King Taejo (940) of the Goryeo Dynasty.